Fetch the current configuration with the GET AWS anomaly detection configuration call. Update the current configuration with the PUT AWS anomaly detection configuration call. You can also manage the same configuration in the Dynatrace UI at Settings > Anomaly detection > Infrastructure > Amazon Web Services. Gets the configuration of anomaly detection for AWS. The configuration of anomaly detection for AWS. How to detect high CPU utilization on RDS. How to detect high RDS write/read latency. How to detect low free storage space on RDS. How to detect DRS running out of memory. How to detect high number of backend connection errors on ELB. How to detect restarts sequence on RDS. How to detect AWS Lambda high error rate. 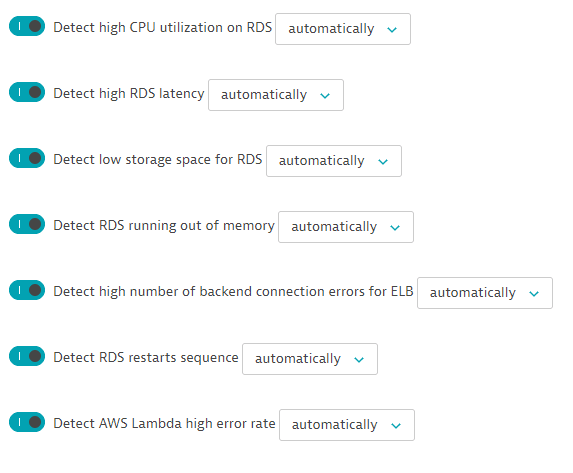 The configuration of the AWS Lambda high error rate detection. Custom thresholds for AWS Lambda high error rate. If not set, automatic mode is used. Alert if failed invocations rate is higher than X% in 3 out of 5 samples. The configuration of the restarts sequence on RDS detection. Custom thresholds for restarts sequence on RDS. If not set, automatic mode is used. Alert if number of restarts is X per minute or higher in 3 out of 20 samples. The configuration of the high number of backend connection errors on ELB detection. Custom thresholds for high number of backend connection errors on ELB. If not set, automatic mode is used. Alert if number of backend connection errors is higher than X per minute in 3 out of 5 samples. The configuration of RDS running out of memory detection. Custom thresholds for RDS running out of memory. If not set, automatic mode is used. All conditions must be fulfilled to trigger an alert. Freeable memory is lower than X Megabytes in 3 out of 5 samples. Swap usage is higher than X Gigabytes in 3 out of 5 samples. The configuration of the low free storage space on RDS detection. Custom thresholds for low free storage space on RDS. If not set, automatic mode is used. Alert if free storage space divided by allocated storage is lower than X% in 3 out of 5 samples. The configuration of the high RDS write/read latency detection. Custom thresholds for high RDS write/read latency. If not set, automatic mode is used. Alert if read/write latency is higher than X milliseconds in 3 out of 5 samples. The configuration of the high CPU utilization on RDS detection. Custom thresholds for high CPU utilization on RDS. If not set, automatic mode is used. 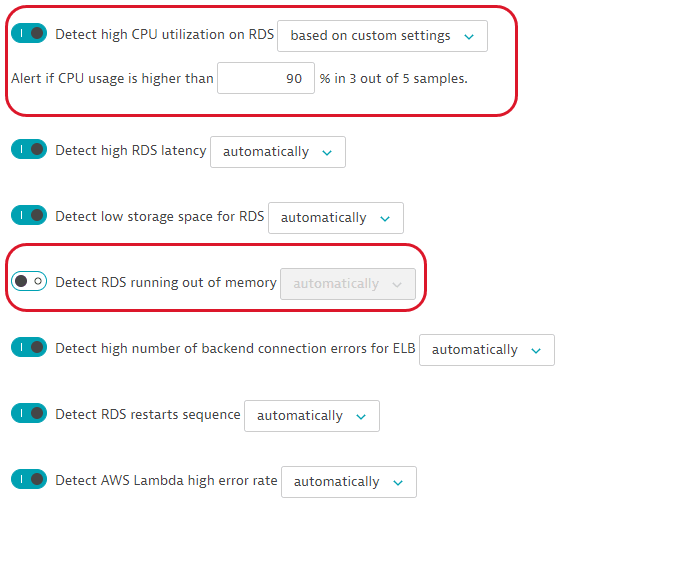 In this example, the request lists the current configuration of anomaly detection for AWS. Updates the configuration of anomaly detection for AWS. JSON body of the request, containing parameters of the AWS anomaly detection configuration. In this example, the request updates the configuration of anomaly detection for AWS from the GET request example. It switches high CPU utilization on RDS detection to the custom threshold mode and sets a threshold of 90%. It also disables RDS running out of memory detection. You can download or copy the example request body to try it out on your own. Be sure to create a backup copy of your current configuration with the GET AWS anomaly detection configuration call. Validates the payload for the PUT AWS anomaly detection configuration request. In this example, the request validates the update for the PUT request example. Response code 204 indicates that the updated configuration is valid, so you can submit it to the environment.